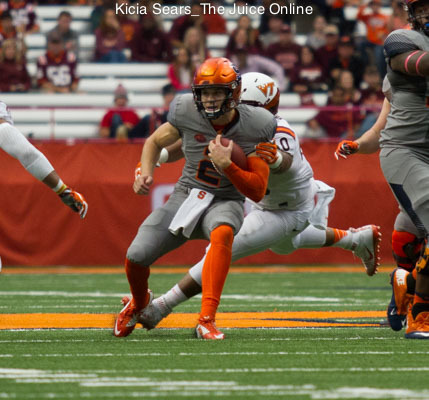 HomeFootballHow does Syracuse football compare to last year through four games? How does Syracuse football compare to last year through four games? 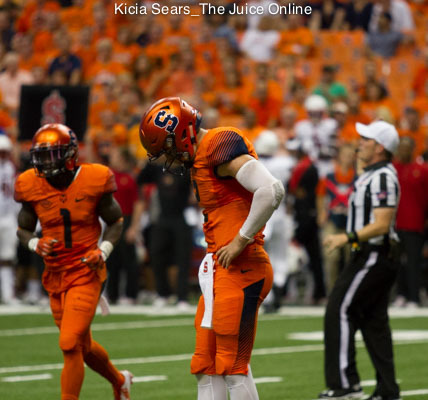 Is Syracuse starting to pick up on Dino Babers' offense? 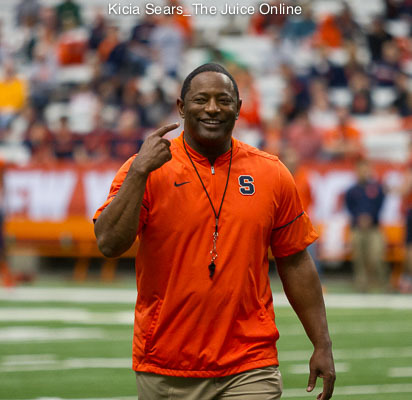 Is Syracuse starting to pick up on Dino Babers’ offense? Are you ready for some imperfect statistical analysis? I knew you would be. Syracuse’s schedule last season roughly evens out with their schedule from last season and not just because they split the first four games each season. One FCS opponent, two “Group of 5” opponents (one pretty good and one mediocre), and a strong “Power 5” foe made up the first four games of each campaign. Last season was Colgate, South Florida, Connecticut, and Louisville. This time around, the schedule has been Central Connecticut State, Middle Tennessee, Central Michigan, and LSU. It’s not an exact science, but here are some numbers from the first four games of 2016 and 2017 to see if Dino Babers’ guys are “green and growing” under him. Looking at the defense, the numbers suggest that, yes, there is lots of growth. First, the team is snuffing out opponents’ rushing attacks. When sacks are removed from rushing stats (come on, NCAA, sacks come on passing plays, just have them count against team passing yards and not the passer’s rushing stats), the Orange are giving up 2.95 yards per carry. Last season, the Orange were giving up 6.08 yards per rush. Even removing Louisville’s gaudy rushing stats (over 400 yards), last year’s defense permitted 4.40 yards per rush over the first third of the season. The pass defense is improved, as well, just not by nearly as much. The Orange defense has reduced the amount of passing yards per attempt allowed thus far from 7.41 yards to 6.98. As a result, the Syracuse defense is giving up 4.97 yards per play overall, down from 6.39 yards per play at this point last season for a 28.6 percent reduction. If the defense continues to permit 28.6 percent fewer yards per opponent play compared to last year, the defense they will vault up from 124th out of 128 FBS teams over the full 2016 season to just outside the top 40. The passing game misses the true deep threat that Amba Etta-Tawo provided last season. SU has slid back from 7.87 yards per pass attempt last season to 6.45 yards per play this season. That has the Orange ranking 99th in the country this season. Steve Ishmael and Erv Philips, the two biggest pass threats on the season, have combined for 72 of the team’s 126 completions. However, they combine to barely average ten yards per grab. The development of a true deep threat would go a long way toward fixing this. However, without that consistent big play in the offensive arsenal, Babers’ offense resembles its Orange predecessors in one key way – they need to string together long drives to get to score. On the brighter side, the run game is improved, even if it does not look like it to the naked eye. The team has boosted its yards per carry (again, with sacks removed) from 3.66 yards per carry last season to 4.69. If you want to look negatively at this improvement, you can point that it is due to small sample size making a pair of 70-plus yard runs weigh so heavily. Strike them from the season’s stats and the run game on paper, anyway, looks quite similar to last year. In last year’s first four outings, a 49-yard run and 29-yard run were the two biggest plays. To “make it fair” by removing the two biggest runs from each set of statistics, the 2016 team posted 3.20 yards per carry. The 2017 squad is averaging 3.79 yards per rush. No matter how you look at it, the ground game is improved over last season by a not insignificant amount. All told, the offense has run two more plays through its first four contests than they did last year. Unfortunately, it has produced 129 fewer yards. That means that over the first four games of each season, the Orange have regressed from 5.76 yards per play to 5.35. The scary part? SU averaged 5.45 yards per play on offense over the entire 2016 season. That ended up with them finishing 84th nationally. Should the team average get dragged down in ACC play again, it will be another long autumn for the Orange. The team needs Dino Babers’ prediction about his offensive system kicking in around the midpoint of the second season to come true if they have any hopes of making a bowl.